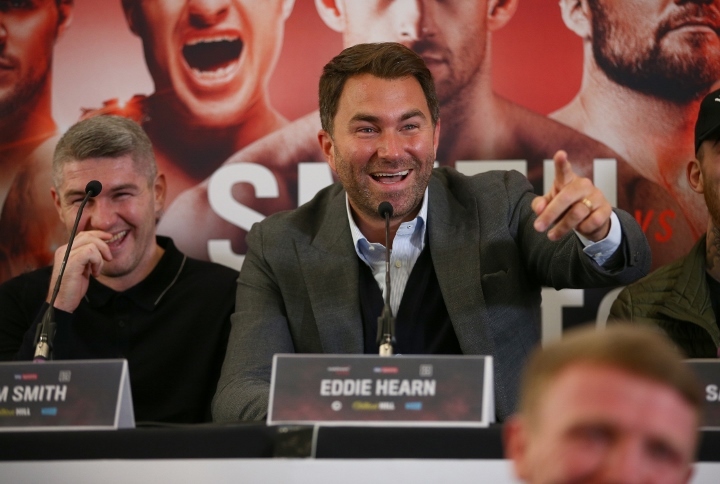 Hearn: Fury-Schwarz is Dreadful, Schwarz is Not Even Top 15! As BoxingScene.com previously reported, Tyson Fury will return to the ring against German contender Tom Schwarz on June15, fighting for the first time in Las Vegas, Nevada. Fury, 27-0 with 1 drawn and 19 knockouts, still labels himself the “lineal champion” despite vacating in 2016 the several versions of the heavyweight world title he won against Wladimir Klitschko four years ago. He’ll be fighting for the first time since a controversial split-decision draw at Staples Center in Los Angeles, last December against Deontay Wilder, who retained his World Boxing Council belt. Top Rank has the Thomas & Mack Center in Las Vegas on hold for the date, with the Nevada State Athletic Commission scheduled to consider the request on March 27. But there remained a chance the fight could be held at an MGM Resorts International property, either the MGM Grand Garden Arena or the Mandalay Bay Events Center. Eddie Hearn, promoter for IBF, IBO, WBA, WBO heavyweight champion Anthony Joshua, threw cold water on the contest and believes it's a complete mismatch. "It’s a dreadful fight. You’ve just fought Deontay Wilder, you’ve basically beat Deontay Wilder – I know it was close but most people had him winning the fight. They’ve ordered a rematch, pulled out of the rematch, and now you’re fighting Tom Schwarz," Hearn told IFL TV. "If Anthony Joshua did that, what do you think the reaction would be? But I don’t blame Tyson Fury. He’s been given a load of money to have an easy touch, no problem. "I just feel that AJ gets a lot of unfair criticism in terms of his resume, and who he’s fighting, and then Fury goes and fights Tom Schwarz. No disrespect to Tom Schwarz, but he’s not even top 15 in the world." [QUOTE=THEFRESHBRAWLER;19617334]Lol he is a casual. Not even worth arguing with him[/QUOTE] Yeah . I know . I usually try to ignore Trolls and Fanboys . But sometimes I can't help pointing out their B.S.